I’m a sporting chap. I like to give a beer an honest chance. And if I don’t like them, such is life. But every now and again I like to give a beer a second chance. With this in mind I swung by Regional on my day off and I grabbed a couple of bottles, including this little suspect. I had several reasons to give this beer a second chance. Firstly, I like Ben Middlemiss.2 Secondly, his Nota Bene abbey ale is excellent. Most interestingly though, I heard (from Ben himself) that this batch was brewed at Tuatara, using his house blend yeast, the same one that gives Nota Bene it’s wonderful funk. It also greatly helped that it now came in a 330ml bottle. At 8.8% this made it less intimidating than the big 500ml bottles and if I didn’t like it, I wouldn’t be stuck with it for too long. As I remember from last time, it was brown-orange colour with an off-white head. As soon as I got my nose near it though, I knew something was different. There’s a distinct funk to this beer this beer that I didn’t find in the last one I drank. Hello there, Nota Bene Yeast. The taste was pretty different too. If last time I found the beer fat and slow, this bottle was much, well… faster. The malt body seemed not so much lighter but less encumbered, like it had had an engine upgrade to give it a better power-to-weight ratio. There was also a pronounced sweatiness that comes from the yeast and a lively hop character that over all made it quite a complex and enjoyable beer. So it seems that this was a good choice for a second chance beer. But it does come with a warning: it’s not in any modern or contemporary sense of the term, an India Pale Ale. For starters it’s 8.8%. In modern beer style terms that make it an Imperial IPA. The closest comparison I can make is to a fuller-bodied and hopped up Nota Bene, or perhaps a maltier Green Flash Rayon Vert. The funkiness integrates quite well with hop character, but is pretty out of place in an IPA. You might consider this to be failing the “does what it says on the tin” test. But then again, I might be missing the point. The stated goal of the beer is to replicate an IPA of the 1700’s. And maybe a beer shipped across the ocean in a none-too-clean barrel would develop a pronounced yeast funk. I don’t know, I was too young to legally drink back then. My point is, this is an interesting beer and well worth trying. Just don’t expect your classic IPA. My other second chance beer was Moa Breakfast. No comment. A brief online exchange between myself, Kieran from Regional and Ben Middlemiss has brought something to light: the bottles currently on sale at Regional are not brewed at Tuatara, but come from an older batch at Harrington’s (as did the one I had in Christchurch). Now this is interesting because my journal from Christchurch describes a completely different beer from my blog notes. What’s changed between the two bottles? Possibly it was a contextual thing: I was just in the wrong mood to enjoy the beer the first-time around. The explanation I’m more tempted by though, it that I simply had an off bottle for some unknown reason: possibly handling or storage, it might have gotten over-heated or whatever. It’s unusual, but not unheard of. Either way, it makes me all the more glad I gave Hodgsons another go. I’ve been reflecting on this. 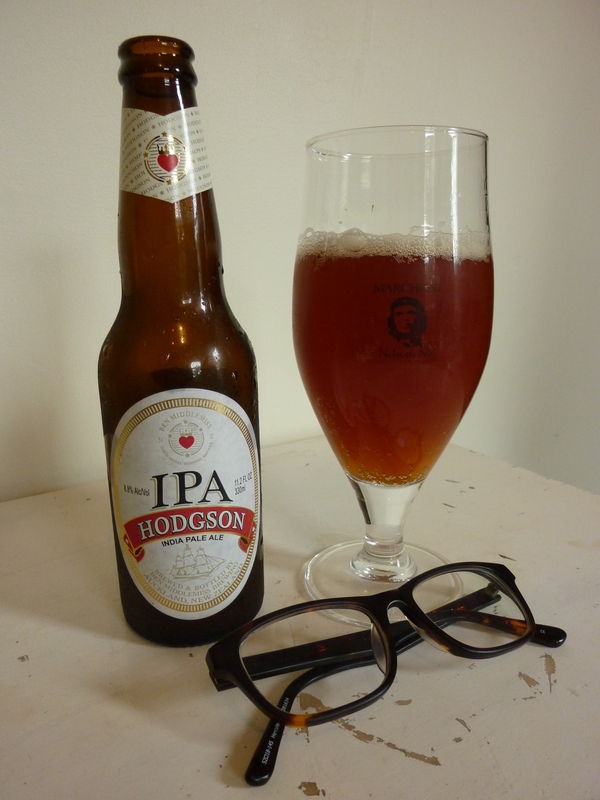 The bottle was purchased some months after Hodgson was first released. On second thoughts, it may actually have been the case that the bottle had been mis-handled or perhaps had some other issue with it. All the more reason to give it a second chance. At Beervana 2011 he was the only Brewer seen consistently hanging around where his beer was being poured, which earned him a lot of points in my book. He’s also a nice chap. This entry was posted in Beer Review, Second Chance Beer and tagged Ben Middlemiss Brewing, Imperial India Pale Ale, India Pale Ale, Second Chance Beer by Dylan J. Bookmark the permalink.